Continuing your journey through American History begun with Level 5 using the series A History of Us by Joy Hakim, you will cover the Civil War through modern day. Choose a side in the tumultuous Civil War, learn what it was like to immigrate to America at the turn of the century, learn about the World Wars of the 20th century, and join the protests during the Civil Rights movement of the 1960s. You will continue your study of the 50 states, in order of their statehood. The final six weeks your child will write a research report. I have provided a research report guide to assist them. You will enjoy a variety of literature selections together. Travel with Homer P. Figg through the United States to find his brother and join the fight at Gettysburg in The Mostly True Adventures of Homer P. Figg, go on a dangerous mission to save the world with the gifted children in The Mysterious Benedict Society and find out what happens when a young girl innocently writes a newspaper editorial about wanting black people to have the same rights as whites in Darby. You will study American artists and complete a variety of art projects, memorize poetry written by great American poets such as Longfellow and Edgar Allan Poe along with The Gettysburg Address, Martin Luther King’s “I Have a Dream” speech and other historical works. 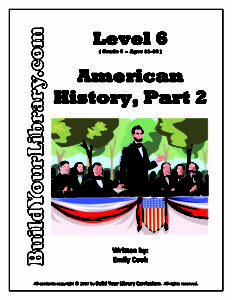 Have you already purchased Level 6 – American History, Part 2? We would love to hear what you think and share your experience with others – Please feel free to leave a product review on the Contact Us page! Thanks for your support!